​On top of the unprecedented financial support the EU has already provided to Ukraine, the institution has sworn to contribute an extra €70mn towards protective structures aimed at making the site of the Chernobyl nuclear accident "safe again." “We have pledged another €70 million to ensure a complete return to a safe environment at the site of the devastating accident at Chernobyl,” European Commission President Jean-Claude Juncker announced at the EU-Ukraine Summit. “The EU is helping to make Chernobyl safe again,” he said a day following the 29th anniversary of the deadly nuclear meltdown of 1986. The newly-announced financial aid put forward by the European Commission is to build a sarcophagus around the damaged nuclear power plant, and comes in addition to hundreds of millions already spent by the EU on environmental safety projects in Ukraine. 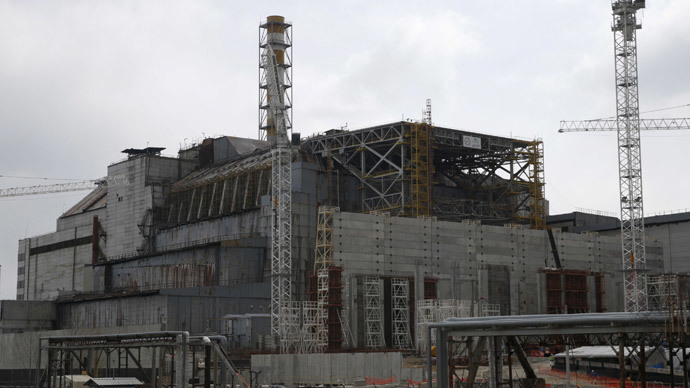 They are mainly aimed at constructing the New Safe Confinement to safeguard the existing sarcophagus and Reactor 4 destroyed during the accident. Nuclear waste management operations are another focus of the EU. The €1.5 billion New Safe Confinement project started in 2010 and is being led by the French NOVARKA consortium. It is expected to completed by mid-2017 and will have a lifespan of a minimum of 100 years. Over the years, the European Commission pledged some €600 million on Chernobyl projects. Industrial projects, according to Commission amounted to €480 million. Power generation support cost EU taxpayers some €65 million, while research projects amounted to another €100 million. But while managing to secure funds aimed at protecting Europe against potential nuclear contamination, Ukrainian president Petro Poroshenko failed to immediately secure the much needed “macro-financial aid” to the country’s crippling economy as he met Juncker and the European Council President Donald Tusk on Monday. The 17th EU-Ukraine summit is the first such meeting held within the framework of the Association Agreement. Its focus has been on the realisation of reforms imposed on Ukraine by the EU, as the country sets for implementation of the free trade deal by early next year. “We have to have this free trade agreement enter into force on January 2016,” Juncker told a news conference. At the same time he reminded that the “issue of Ukraine’s joining the European Union is not on the immediate agenda,” after earlier in the day Poroshenko called on the EU to grant Ukraine membership in the bloc. “What they are really trying to do is to convince large numbers of Ukrainians to have hope, faith, that in some sort of long-run they will be able to prosper as part of Europe in a way that either cannot or wouldn’t happen if they didn’t go in this direction,” Richard Wolff, economist and author of Democracy at Work: A Cure for Capitalism told RT. The EU side reiterated its commitment to support Ukraine’s sovereignty but have refuted Kiev’s calls to send a EU peacekeeping contingent to Donbass. “We know about Ukrainian expectations today, but it’s impossible to send a military mission,” said Tusk after meetings with Poroshenko on Monday. The EU would “send as soon as possible a civilian assessment mission ... to assess the humanitarian situation,” Tusk added. The association agreement ratified by both Ukraine and the EU in mid-September of 2014 lies at the heart of the Ukraine’s year of turmoil. People in Kiev started to flood Kiev’s Independence Square soon after then-President Yanukovich chose to put off a final decision on economic integration with the EU, saying he needed time to weigh possible gains and losses. The association agreement between Ukraine and the EU, eventually signed after the coup, envisages a gradual deepening of economic and political ties hoping to help integrate Ukraine into Europe’s $17 trillion economy.